Lucinda Childs, John Adams, and Frank Gehry’s Available Light premiered in 1983 at the Los Angeles Museum of Modern and Contemporary (MOCA). The piece is now considered to be one of the most significant works to come out of American performance and is thought by many to be a masterpiece. Each of the contributing artists—Childs, Adams, and Gehry—have become world famous in their respective fields of dance, music, and architecture. 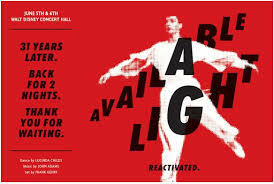 The present remounting and tour of Available Light (at Berkeley’s Zellerbach Hall) is a chance to go back to a moment when they all were on the cusp of fame and see how they negotiated creating a piece of art together. And the issue really is about artistic collaboration and the way they imagine it. The first thing you notice is the striking stage design. The set is on two levels, connected by four large metal screens, which creates a conversation between the dancer and the music. Childs has said, “I loved the idea of a split - level set, and I loved the idea of doubling things.” One of the odd aspects of the set is that the floors are pure white. In fact, the whole stage is black and white. The effect of these contrasting colors is that it catches your eyes and makes you look for difference. There were ten dancers, wearing simple ballet clothes in contrasting colors such as, red, white and black. The music starts with one loud note of electronic sound, and then goes very calm. The dancers dance between the light from one side of the stage to the other. The effect creates beautiful shadows between the dancers and everywhere we look there is an abundance of negative space. So for Geary, Childs, and Adams collaboration requires room: the different elements of the work are always combining to create different types of negative space. And by that I mean the space between light, the space between dancing and not dancing, and the space between silence and Adam’s music. The piece seems absolutely aware that the best way to work together is to not really be there or to create multiple spaces. So the collaboration for them is not a form of coming together, but a way of staying apart. To give a clearer sense of what I mean by this this is what it’s like watching the performance. Everything feels smooth. You don’t really notice the seams, it’s just as if everything is happening at once. The whole stage looks like a moving painting. The dancers move between the lights, as if they were running through an abstract landscape. It is a wild mix and yet it is orderly and neat. Adams said, “It wasn’t until I was sitting and watching the rehearsals that I realized how hard it was for dancers to find something to hold on to, I would have done differently if I knew that.” And you can tell from the piece that Childs has listened to Adam’s music carefully and understood Geary’s set in a deep way. When I was watching the performance, I almost forget that this was a complete collaboration between three equal partners.